Reviews. Who uses Reed and Squeak cases ? The Reed and Squeak Compact Double case is fantastic ! It is light, compact, has plenty of storage room for reeds and music etc and most importantly keeps my instruments very secure. The shoulder straps make it very comfortable to carry on my back. I would recommend it wholeheartedly to any clarinettist. 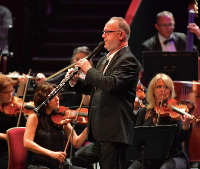 Tim Lines - Freelance Clarinettist ex LSO and CBSO. In order to reduce the number of items I take with me whilst on the road I was looking for a new case that could carry both my bass clarinet and a pair of clarinets. The Reed and Squeak triple case was exactly what I was looking for – a good sturdy, well designed case at a very affordable price. The case is compact but the instruments fit in with ease, and the inner compartments are flexible with plenty of cushioning so I don’t have to worry about there being too much pressure on the delicate key-work. And there is room for all the extras I need to carry around with me – reeds, cleaning swabs, tool kit, music etc. Lenny Sayers - Principal Bass Clarinet BBC NOW. The Reed and Squeak bass clarinet case is undoubtedly the best I've ever used. It's light, strong and spacious and has shown itself to stand out from others I've tried in the past. Recently, I was forced to put it to the test when I was unable book a seat for it on a flight to London. I was informed it had to go in the hold and no amount of diplomacy or persuasion on my part would make the airline change its mind and allow me to take it into the cabin. Since I was committed to the playing the engagement, I had to let it go and hope for the best. After literally years of searching the web for a gig bag for my contrabass clarinet, I found Reed and Squeak. And I couldn’t be happier! Until now I have had, 2 different cases. The original wooden box model and a long unpadded gig bag model. The first was heavy and was impossible to carry around. It did protect the instrument. The second was very easy to carry, lightweight and with backpack straps. Unfortunately the instrument wasn’t secure inside, so it broke all the time. Now I'm a happy camper! The gig bag from Reed and Squeak suits all my needs. It is sturdy, and the instrument is very, very secure inside. I can ride my bike with it. I can put it with my other horns in the car. It is even possible that I would allow it to be checked in as baggage on a flight. There is plenty of room for accessories, floor peg, sheet music, reeds and other stuff you might need when doing a gig. You might even be able to fit your lunch box in there ! The only downside there is to the case is the weight. But compared to all the good things, it is a very minor detail. On top of all this, Mark at Reed and Squeak is so nice doing business with. Great service! Need anything from that shop, don’t hesitate. Thanks again for the case. I'm using it and I love it!! Dougie Mitchell- ex Royal Philharmonic Orchestra.